Celebrate the Naval Aviation with a coffee mug that features an aircraft from each of the four major eras of Naval Aviation. The first plane is the Curtis Jenny which was the first trainer in the Navy. The second is the gull wing F4U Corsair that had an outstanding combat record in WWII and Korea. The third is the A-4 Skyhawk that was the mainstay of the Vietnam War. The fourth plane is the current workhorse of the Navy, the F/A-18 Super Hornet. The Super Hornet cutaway is drawn as the plane is going to be launched by the steam catapult and includes the shooter. The top, side, and front view of the planes are all drawn in proportion to each other. The top views and side views are on the left hand side of the mug, the front views with the fresnel lens are opposite the handle, and the cutaways are on the right hand side. 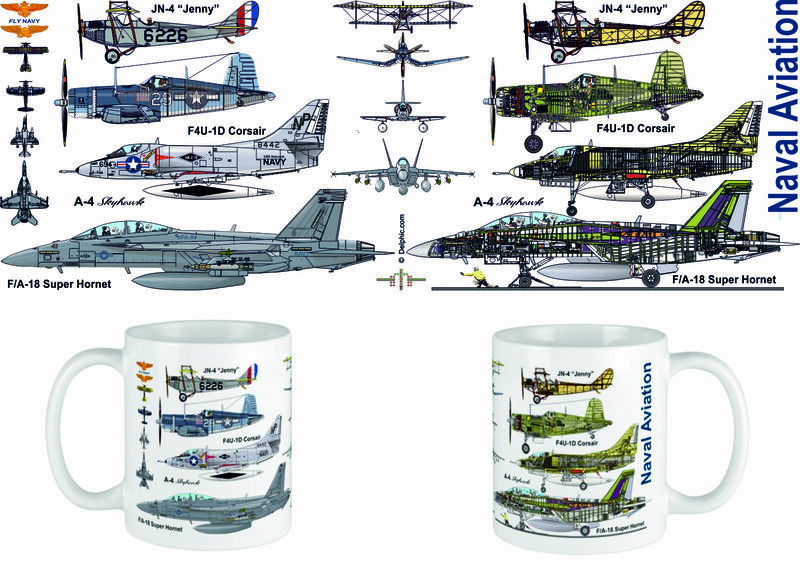 Our famous and highly detailed aircraft cutaway designs are presented here in full color on these handsome 11 ounce multiple use mugs.